Combine graham cracker crumbs, sugar, cinnamon and butter in a bowl. Press onto the bottom of an ungreased 9-inch pan and refrigerate for 30 minutes. Place pineapple and cornstarch into a blender and blend to a puree until smooth. Pour pineapple sauce into a saucepan. Bring to a boil over high heat. Boil and stir until sauce is thick and shiny, about 2-4 minutes. Set aside 1/3 cup pineapple sauce; let it cool. Cover and refrigerate remaining sauce for serving. Beat cream cheese in a mixing bowl with an electric mixer until light and fluffy; slowly beat in condensed milk. Mix in lemon juice and vanilla extract, then beat in eggs on low speed until just combined. Pour half of cream cheese mixture over crust; drop half of reserved pineapple sauce by 1/2 teaspoonfuls on cream cheese layer. 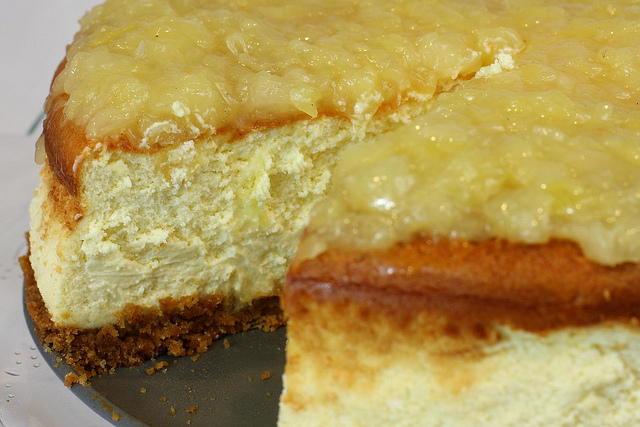 Carefully spoon remaining cream cheese mixture over sauce; drop remaining pineapple sauce by 1/2 teaspoonfuls on top. Cut through top layer only with a knife to swirl pineapple sauce. Bake in preheated oven until center is almost set, 50-60 minutes. Cool on a wire rack for 10 minutes. Use a knife around edge of pan to loosen and let it cool 1 hour longer. 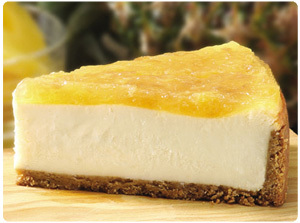 Refrigerate the pineapple cheesecake overnight. Serve reserved pineapple sauce with cheesecake.